Porcelain is an excellent material for restoring teeth. It mimics natural tooth structure more closely than any other material. It can be made with the same colors, translucency, and surface texture as natural teeth. It is harder than enamel, and it resists staining and wear. Porcelain can be used in dental crowns. See our porcelain crowns page for more information. 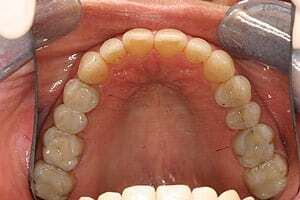 But when the tooth is merely weakened and much healthy enamel remains, an onlay is a more conservative restoration that preserves as much of the healthy enamel as possible while strengthening your tooth. Porcelain Inlay vs Onlay – What’s the Difference? An inlay sits inside the tooth. Porcelain onlays will restore the inner part of the tooth but will also cover over weak parts of the tooth. Photographs below show both inlays and onlays. An onlay will cover one or more cusps of the tooth, but will not go all the way to the gumline as a crown would. So it keeps natural enamel next to the gums and is therefore healthier for the gums. It is also a very long-lasting restoration. This patient asked Dr. Thein to remove her old silver amalgam fillings. 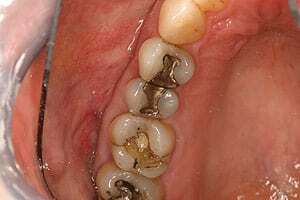 The amalgam has been removed, showing that the teeth are seriously weakened, with crack lines showing in a number of places. Dr. Thein placed porcelain inlays and onlays. Not only have they strengthened her teeth, but they look natural.